Place tomatoes. 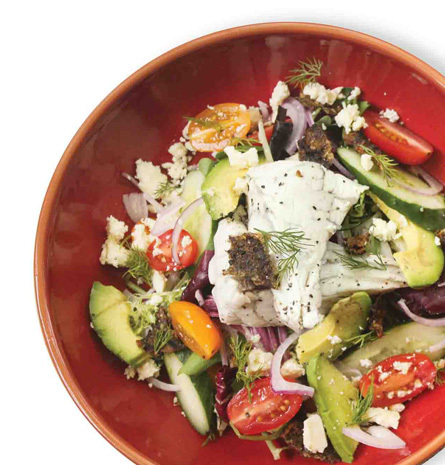 cucumber, onion, avocado, feta cheese and dill into a bowl. Drizzle with olive oil, lemon juice and sea salt & pepper to taste. Toss gently to combine. Remove skin from barramundi and season with salt. Pan-fry the skin in olive oil till crispy and break into small pieces. Bring water to a boil and add 1tsp sea salt. Reduce heat and add in the barramundi meat. Cover pot and cook for 10 - 15 minutes or until fish is opaque. 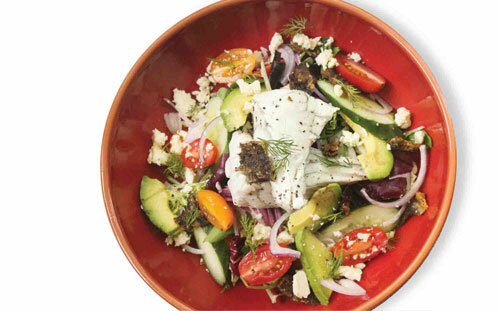 Spoon mixture over a bed of salad greens in a serving bowl and place poached barramundi on top. Sprinkle barramundi skin over and serve.